The best moment to take care of your body and mind was yesterday, but good news, the second best moment is now! It’s never too late to change your life today! Among our audios, you will find free meditation music that will help and enhance your meditation practice. And if you don’t practice meditation, our audios will take you easily and rapidly into a deep conscious state. In a very effective way, you’ll eventually get benefits which are close to a regular meditation session within a few minutes per day. If you need further help on your journey to master your mind, we offer guided meditation to support you on your meditation journey, as well as subliminal music with powerful affirmations which will facilitate the reprogramming of your subconscious mind. So, just find in a quiet place, put yourself in a comfortable position and you’re good to go. If you would like to learn meditation or discover a new method (free), you may want to check out Gaia Meditation® method. 100% free audio tracks, available for download and streaming on our website and on Gaia Meditation YouTube channel. Please note that the recordings are free for private use only. If you would like to download them for a non-private use (commercial purpose etc. ), you must get a license here. High-Quality MP3 (320 kbps) – high rendition of sound frequencies to ensure optimal benefits. Were developed following both scientific studies, particularly about brainwaves, and metaphysical studies/ancient universal knowledge. Free tracks main categories include: meditation music, relaxation music, sleep music etc., embedding binaural beats, isochronic tones, 432 Hz, 528 Hz and other Solfeggio frequencies. 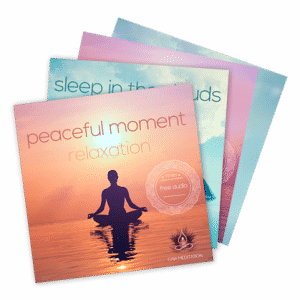 We also offer free guided meditation audio tracks to help you with your practice of meditation, as well as free subliminal music to facilitate the reprogramming of your subconscious mind. Disclaimer: Gaia Meditation music constitutes a complementary help for health and well-being, and is not intended as a substitute for medical or psychological treatment of any kind. If you are dealing with any sort of medical or psychological condition, experiencing seizures or have any other neurological or neuro respiratory conditions, we suggest you consult with your health practitioner and use our music under his supervision. Gaia Meditation and its affiliates assume no responsibility for the use or misuse of our information or music. Individual results will vary. Use only as instructed - never while operating machinery, driving or performing other hazardous activities.